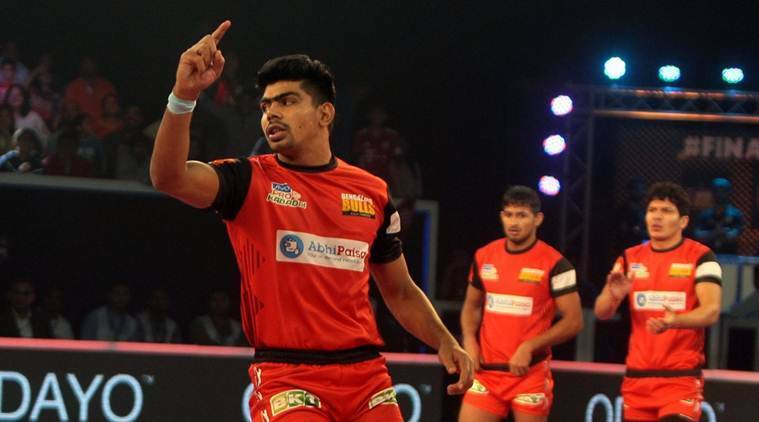 Bengaluru Bulls made a brilliant comeback to defeat Gujarat Fortunegiants in the final of Pro Kabaddi Season Six. Bengaluru Bulls won their maiden Pro Kabaddi title on Saturday as they beat Gujarat Fortunegiants in a thrilling final of the sixth season. The Bulls made a brilliant comeback to beat Gujarat for the second consecutive time and lift the trophy. Bengaluru’s Pawan Sehrawat was the star of the night as he collected 22 points from 25 raids. Gujarat Fortunegiants finish runners-up for the secoind straight year. Bengaluru started well, taking the first point of the tournament final clash. However, Gujarat gave a tough competition to take the lead, inflicting an all out in the first half. The match began on a strong note as both the sides kept the game level at 3-3, before taking it to 7-7. Sachin got a Super 10 and Gujarat were in the contention of the title till the final few minutes but fell short in front of Sehrawat. Prapanjan made a two-point raid to inflict an all out on Bengaluru Bulls, helping Gujarat go into the half-time with 16-9 lead. Gujarat maintained their lead at the start of the second half before Sehrawat took matters in his hand with a number of successful raids to inflict an all out on the Fortunegiants that gave the Bulls the lead and command of the game by a point. The match turned to its peak when the two teams were level at 29-29 with just three minutes left for the final whistle before the Bulls inflicted another all out to win the match by five points. 2 Pro Kabaddi League Final Live Streaming, PKL Season 6 Final: When and where to watch PKL final?